Ok, so now I am sure it looks like I am obsessed with tacos, which I assure you I am not. However, Rachael Ray is the self professed “Burger Queen” so who knows, maybe I will be come the “Taco Queen”. Seriously anything you put into a burger you could put into a taco. Both are nice hand held food options. Anything that reduces the amount of dishes to wash is alright by me. But I leave the grilling to Kevin so burgers he does, taco’s I can do. This recipe was actually my answer to a burger patty I saw available at my local grocery store. They have a lot of pre-made dishes you can buy. Chicken Cordon Blue, Steak Pinwheels and burgers. They have bacon and blue cheese burger patties, cheddar burger patties, and they had turkey with feta and spinach patties. I decided that I wanted to make my own patties so I could add the seasoning I wanted. I was discussing the idea with my daughter Jessi and told her that I wanted to use pita bread instead of a burger bun. 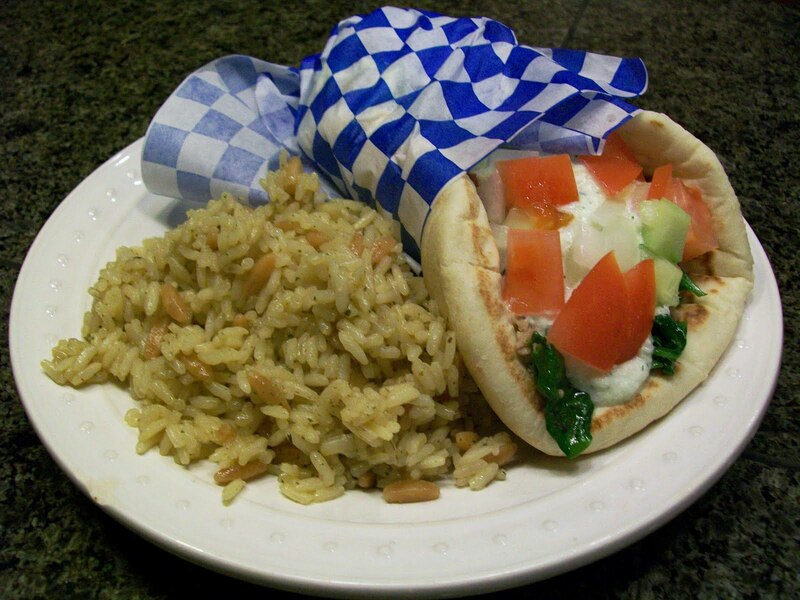 She felt that a patty on pita would be a bit awkward to eat so, WALA the Greek taco was born! I did a search on Greek seasoning and Tzatziki recipes. I saw a couple of advertisements for Greek seasoning blends, but I prefer to control the amounts of each seasoning going into my recipes. You can substitute ground lamb for the turkey in this recipe. I opted for a lean turkey (97%) to lower the calories a bit. Pair it up with some rice pilaf and you have a great meal. I use the rice on the as a side but the kids just added it in with the other ingredients. I hope you give this recipe a try. Oh and make sure you save your extra Tzatziki sause. It is awesome with veggies for a snack! If you don’t want leftover sauce, just cut the recipe in half, but we always love leftovers. Try using the Tzatziki in the place of mayo on sandwiches too! If you can’t find Greek yogurt strained plain yogurt can be substituted. Thanks to our local Greek restaurant Ikonos for the donation of the checkered paper to make this look so nice! With a small strainer or coffee filter over a bowl, strain the yogurt for about 2 hours to get as much liquid out as possible. Peel the cucumbers and then cut the cucumber in half lengthwise. Use a spoon to scrap out the seeds, then dice the cucumber, making sure to reserve half of one half for garnish. Place the cucumbers in a colander and salt them to draw the liquid out. Let sit for about 30 minutes. Drain them well and pat dry with paper towel. In the food processor puree the cucumbers, garlic, lemon juice, dill, and fresh ground black pepper. Stir the mixture into the yogurt. Add salt to taste. Place in the refrigerator for about 2 hours to allow the flavors to blend. Heat a large skillet over medium-high heat. Add the ground turkey, breaking it up with a wooden spoon. Add the thyme, basil, marjoram, oregano, minced onion and minced garlic, season with salt and pepper. Continue cooking until turkey has been broken up and it browned all over. Add baby spinach and stir to wilt it down into the browned meat, then add 2 ounces of the feta cheese. Stir to combine all ingredients well. Remove from the heat. Heat pita bread in the microwave approx 30 minutes to soften the bread. Spoon the turkey mixture into the center of the pita, top with Tzayziki, chopped onion, chopped cucumber, and chopped tomato. Fold like a taco and eat. Fish taco’s became very popular in Ensenada, Mexico in the late 60’s. Being from San Diego, CA, fish tacos became one of my favorite things to eat. I will admit at first I thought they sounded a bit strange, but I was a teenager, what did I know? I knew I loved tacos I just wasn’t real sure about the fish part of the equation. When a friend of mine told me how much she loved them, I broke down and gave them a try. Boy was I HAPPY I did (This was the same friend that talked me into trying sushi…..she had great taste I am so glad I listened!)! Fish tacos bring back a lot of memories for me. Growing up in a coastal community I spent quite a bit of my time at the beach. They have since built up the area that used to be my old stomping grounds, but the little taco shop on the corner is still there. It was so fun to spend the day swimming and sunning with friends and then be able to just walk over to the taco shop in our bathing suits and get our lunch. Beach towns are the greatest! The original fish tacos are fried fish fillets with a white sauce, cabbage and cheese and of course hot sauce if you wanted it. The sauce in this recipe gives you a little bit of that hot sauce kick without making things super hot. Like I have said in the past, we love heat in this house, well 3/4’s of us love heat at least. Jessi, Miss Picky, loved, Loved, LOVED, these tacos. She even saved the left over sauce because SHE said it was too good to waste…WOW color me shocked! I actually ran out of fish because everyone wanted to eat so many. Next time I will make sure to buy extra. For anyone that hasn’t tried fish tacos let me say this. 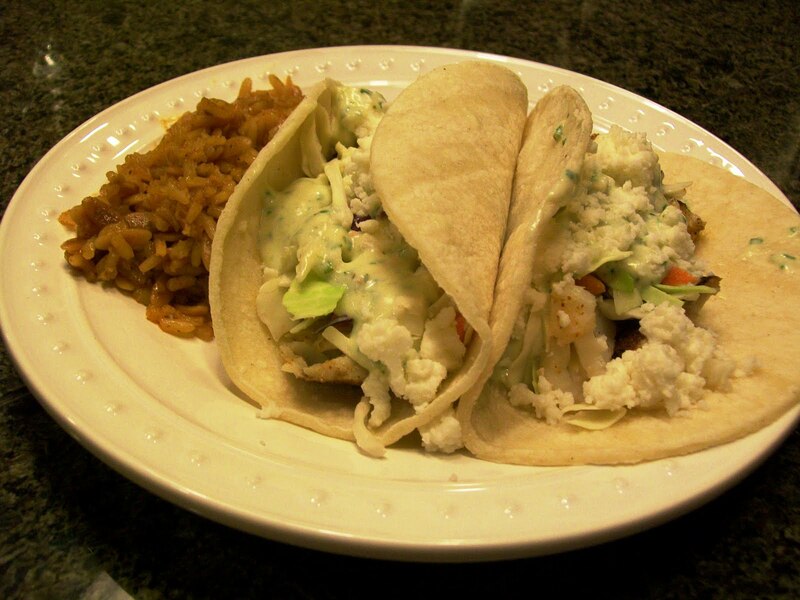 If you love fish, and a bit of Mexican flavors, you will love these tacos. 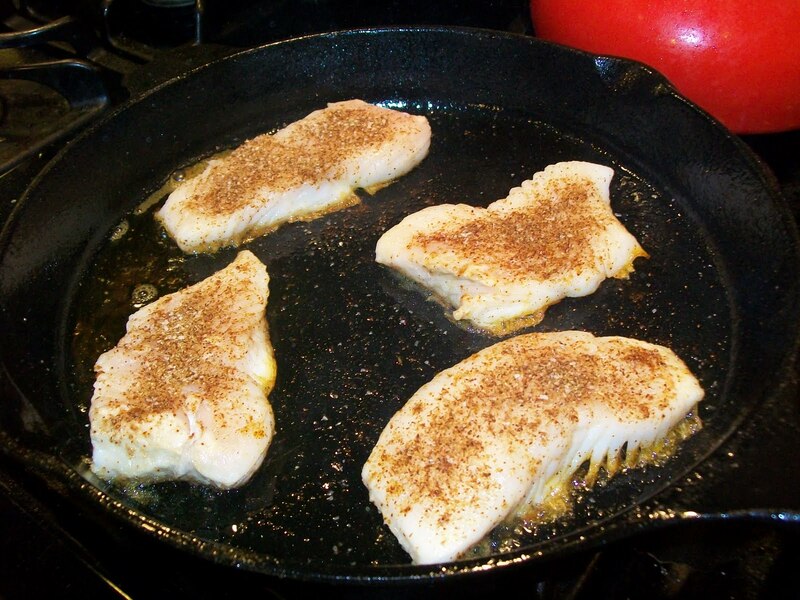 After I rubbed the fish with the spice mixture, I placed them in a screaming hot cast iron skillet coated with a couple tablespoons of vegetable oil. After about 3 to four minutes (you will see the fish beginning to turn opaque) I flipped them with a metal spatula. Be careful that the fish doesn’t come apart on you. I slid the spatula under very slowly kind of scraping the pan as I went. You don’t want to lose that yummy spiced crust! This picture could have been better. This one was my boyfriends and he loved the sauce so much you really can’t see the fish. But trust me, it looked good and tasted GREAT! Into a food processor place the mayo, sour cream, lime juice, and cumin, puree. Once the sauce is smooth add the cilantro leaves and blend until combined. Set aside. Remove fish from the refrigerator and pat dry on both sides. In a bowl combine the cumin, salt, coriander, and chili powder. Rub the spice mixture on both sides of the fish making sure to coat evenly. Heat a large skillet or grill pan over high heat. Add the fish and cook on both sides until the fish is opaque approx 3 to 4 minutes, depending on the thickness of the fish fillet. 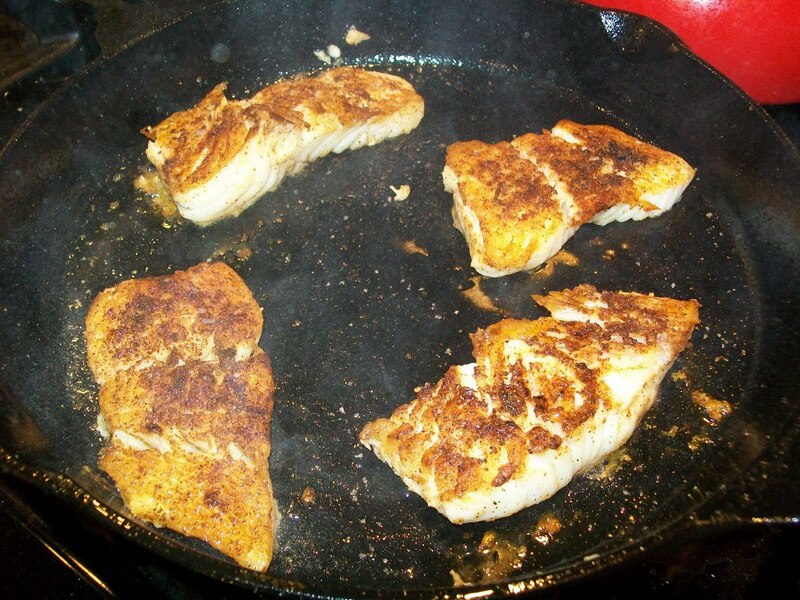 Remove fish to a platter or plate and flake it into nice large “planks” of meat. 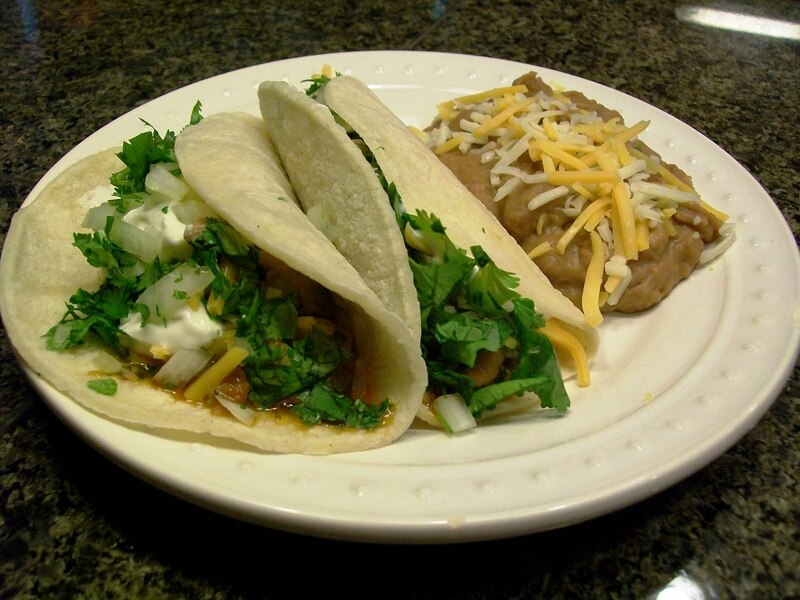 Remove tortillas from the oven and fill them with the fish, cabbage, sauce, cheese, and tomatoes. I was trying to figure out what to make for dinner and started thinking about the fact that Cinco De Mayo is coming up. I am a HUGE fan of Mexican food! I grew up in Southern California and Mexican food is a staple there. I probably ate Mexican food, be it in just the form of a burrito at home, to a sit down dinner at a restaurant, 3 to 4 times a week. Living here in Western Washington I miss good Mexican food. I decided to make some chicken tacos, but like many other foods in my house, they had to be spicy chicken tacos. I am not talking, blow the top of your head off or melt your tongue spicy. But these babies pack some heat. Your mouth will feel nice and warm. If you want to dial the heat back you can remove the ribs and seeds from the peppers, or substitute poblano for the anaheim chilis. This recipe also uses one of my favorite ingredients, boneless skinless chicken thighs. You can get so much chicken flavor very quickly out of the thighs vs breasts. I buy my chicken thighs in multi packs from Costco. You get several packages of thighs in vacuum sealed plastic, so you can pop them in a sink full of warm water to thaw out quickly if you forget to plan something for dinner. Not like I have ever done that or anything. HA I am the QUEEN of forgetting to plan ahead! Liberally salt and pepper chicken. Preheat large skillet over medium-high heat. Add vegetable oil and chicken. Let the chicken cook for 5 minutes, stirring to make sure all sides get browned. Push chicken to the edges of the pan and add the chilies, garlic, and onion to the pan. Cook for 3 to 5 minutes stirring occasionally. Add chili powder, cumin, and coriander, stir to make sure all of the chicken and veggies are coated well. Reduce heat to medium and cover the pan. Cook for 15 minutes, stirring occasionally. Remove the lid and reduce heat to low, add 1/4 cup of chopped cilantro leaves, let cook on low while you prepare the tortillas. Place tortillas in a damp paper towel and heat in the microwave for 45 seconds. Remove the tortillas from the paper towel and fill each tortilla with the chicken taco mixture. Top with sour cream (if wanted) and sprinkle some of the remaining cilantro leaves and finely chopped white onion. Before we even get started, I know some of you are groaning at just the mention of a turkey noodle casserole. I was kind of “iffy” on this one myself. 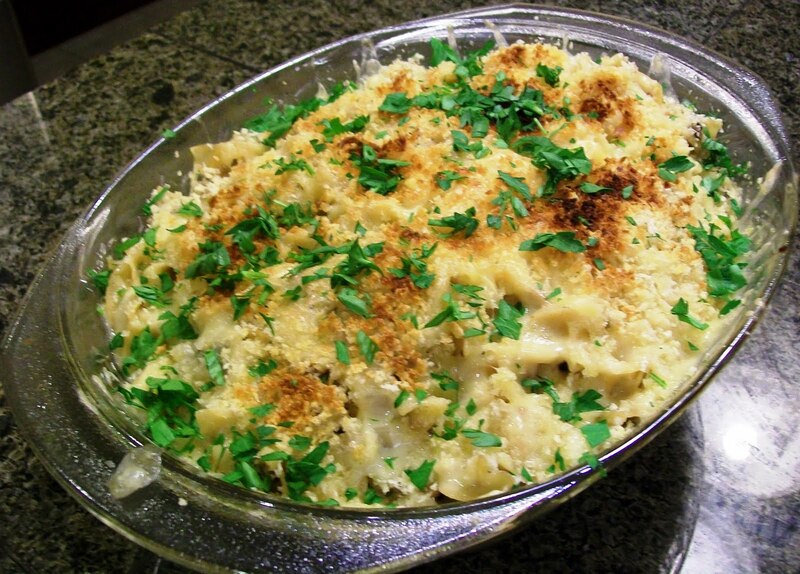 The word casserole just brings back memories of tons of noodles smothered in cream of mushroom soup with some meat to go with it, usually canned tuna in my house. YIKES! Not a good image. I know that is how things were done in those days, and people didn’t realize how much sodium and fat canned soups contained. This recipe, thank goodness, removed those images from my head and made me gain faith in casseroles. I wasn’t the only one that showed a lack of enthusiasm for the idea of casseroles. Pretty much everyone here felt the same way. The dialog went kind of like this, “Mom, what’s for dinner?” “Turkey noodle casserole”….long pause…”Oh”…..longer pause….”Really?” “Yes, why?”..pause..”Oh, just wondering”. I know what they were wondering was, can I eat something else before dinner without Mom finding out and then say I am not that hungry. Luckily we were all pleasantly surprised. Everyone liked it, including my Dad, but I felt like the sauce could be a bit thicker. Probably a throw back to the old cream of mushroom soup days, but the sauce is more of a broth really. I might try to make a roux next time and thicken it up that way. I don’t want to change the flavor, just the consistency. This one is a keeper to me though. Fairly simple and flavorful and something I think anyone would eat, so picky eaters would be happy as well. Bring a large pot of water to a boil for the egg noodles. When it boils, salt the water and cook the noodles al dente. Drain well and return to the pot. Preheat a large, deep skillet over medium-high heat. Add the EVOO and the bacon. Cook for 2 to 3 minutes, until the fat is rendered and the bacon begins to crisp at the edges. Add the turkey and brown it, crumbling with a wooden spoon. Move the meat over to one side of the pan and add the mushrooms and onions to the opposite side. Cook the mushrooms and onions for 3 to 5 minutes, then stir the meat and veggies together. Season the mixture liberally with salt and pepper, and sprinkle in the ground thyme or poultry seasoning. Cook for another 5 minutes. Add the wine and deglaze the pan, using the wooden spoon to scrape up the pan drippings and browned bits. Stir in the stock and bring to a bubble, then stir in the cream and reduce the heat to low. Add nutmeg and stir. taste to adjust seasonings if necessary. Preheat the broiler to high. Combine the noodles with the turkey and sauce. Grease a casserole dish with a little softened butter. Transfer the turkey-noodle mixture to the dish and top with Gruyère cheese and then bread crumbs. Place the casserole 8 to 10 inches from the broiler and brown for 2 to 3 minutes, or until the cheese is melted and the crumbs are brown. Garnish the casserole with parsley. Serve with a green tossed salad. I had some linguica sausage and really wanted to do something new with it rather than just grill it. After finding some great veggies in my fridge, and doing a quick search on Google about Portuguese seasoning, I rolled up my sleeves and got to work. 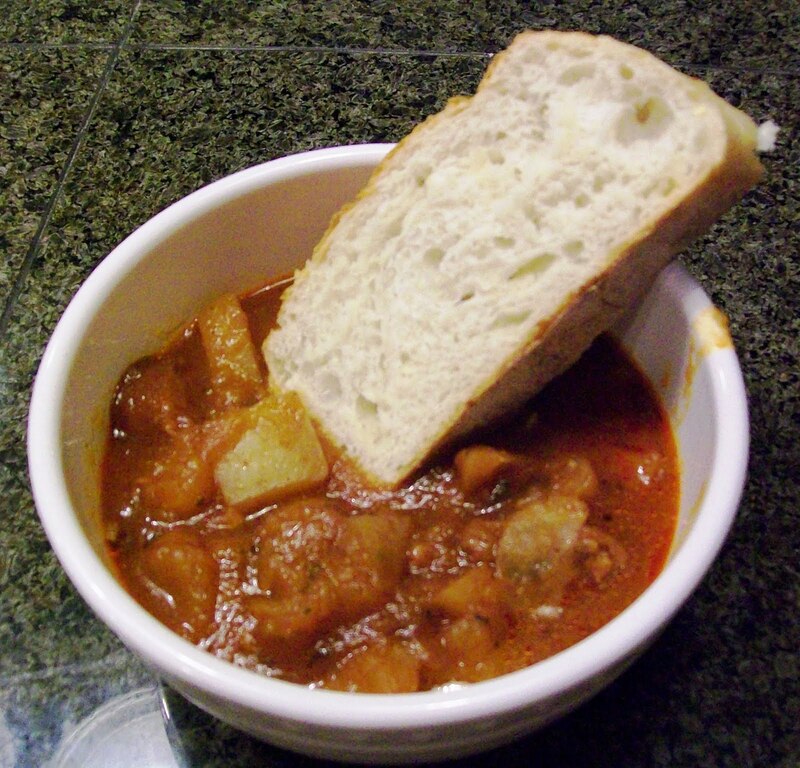 Jessi, my daughter, labeled the left over stew “The stew of my people” since she is part Portuguese she takes the credit for the inspiration that created this recipe. Gotta love her!! This stew does well in the freezer. I always use the gallon freezer bags and lay them flat to freeze. Then you can stack the soups and stews or store them vertically. Make sure you label the bag or you will end up playing “Name That Leftover”! This stew will take a large slow cooker. Heat a skillet over medium-high heat. Add the olive oil to the pan and then add the chopped bacon, cook for about 3 minutes, just until the bacon begins to render fat. With a slotted spoon, remove the cooked bacon and reserve. Add the onion and garlic to the pan, cook for about 5 minutes, stirring frequently. Add the sliced linguica and continue to cook another 3 minutes or so. Add cooked bacon, onions, garlic, and linguica to the slow cooker. In a bowl mix the tomatoes with all of the spices and red wine. Pour tomato mixture into the slow cooker. Add the potatoes, zucchini, parsley, oregano, salt, and pepper to the cooker and give it a good mix. Cover and cook 3 hours on high, or until the potatoes are tender. Stir occasionally. Ladle into bowls top with a couple slices of bread and ENJOY!! I am a HUGE seafood fan. I love it anyway I can get it. But now that I live in The Pacific Northwest I am always searching for the perfect warm bowl of stew or chowder. That is what put me on the quest to make the perfect crab chowder. Not that I think I am perfect, but I gotta say that this chowder comes pretty close! Grill me a steak and lobster tail when it is nice outside. When it is drizzly and cold let me get my seafood fix with this warm, rich, and yummy chowder!! Put diced potatoes in a pot with cold water just covering them. Heat them to boiling, and then simmer 5 mins. You just want the potatoes par-boiled. Drain potatoes and set them aside. Heat a soup pot over medium-high heat with the 2 tablespoons olive oil, add chopped bacon and cook until fat is begins to render. Stir the onion, garlic, and celery in with the bacon and saute until translucent, about 5 mins. Turn heat to low and add the flour, mix well and let cook about a minute. Whisk in wine slowly, then add the diced cooked potatoes, parley, paprika, white pepper, seafood seasoning, and salt and pepper to taste. Slowly add the half and half, stirring constantly. Add the corn, and gently fold in the crab meat. Stir slowly until corn and crab are heated through. I wanted to post one that is for one of the favorite holidays in our house, St Patty’s Day! Everything from green beer to green feather boas, shamrock glasses, and blinking pins and jewelry will be found here. Actually you never know WHAT you will find in my house on St Patty’s Day, BUT I can guarantee you will find some awesome Irish inspired food!! In a large pot bring the potatoes and garlic to a boil reduce heat to medium and cook, uncovered, until the potatoes are fork-tender, about 15 to 20 min. Drain and return to the pot. Add the sour cream, 1/4 cup of broth, butter, salt and pepper, and mash until the potatoes are light and fluffy. If the mixture is too dry, add the remaining 1/4 cup broth. Cover and set aside. Preheat the oven to 350 degrees F. Spray a 10-inch round baking dish with nonstick spray. Heat a large skillet over medium heat. Add the bacon and cook, stirring occasionally until browned and almost crisp. With a slotted spoon, transfer the bacon to a plate, set aside. Add the oil to the drippings in the skillet and over medium heat add the onions and 1/2 teaspoon of the salt, and cook, stirring occasionally, until the onions are very soft and just beginning to brown, about 10 min. Sprinkle in the sugar, and cook, stirring occasionally, until the onions begin to caramelize, about 5 min. Stir in the beef and cook, until the beef begins to brown. Add the carrots, peas, and garlic and cook, stirring, until the vegetables begin to soften, about 5 min. Stir in the tomato paste and flour and cook, stirring, until well blended. Add the beer, bring to a boil for 3 min. Using a wooden spoon scrape up all the browned bits from the bottom of the pan. Add the cooked bacon, the broth, rosemary, the remaining 1/2 teaspoon of salt, and pepper to taste, and bring to a boil. Reduce the heat and simmer until the sauce thickens, about 15 min. Spoon the filling into the baking dish. Spread the potatoes evenly over the beef mixture. Bake until the topping is lightly browned, about 35 min. Remove from the oven, top with cheese and bake for 10 min. Remove from oven let rest for 10 min. Top with parsley, serve.